(Nanowerk News) In the quest for sustainable alternative energy and fuel sources, one viable solution may be the conversion of the greenhouse gas carbon dioxide (CO2) into liquid fuels. Through photosynthesis, plants convert sunlight, water, and CO2 into sugars, multicarbon molecules that fuel cellular processes. CO2 is thus both the precursor to the fossil fuels that are central to modern life as well as the by-product of burning those fuels. The ability to generate synthetic liquid fuels from stable, oxygenated carbon precursors such as CO2 and carbon monoxide (CO) is reminiscent of photosynthesis in nature and is a transformation that is desirable in artificial systems. For about a century, a chemical method known as the Fischer-Tropsch process has been utilized to convert hydrogen gas (H2) and CO to liquid fuels. However, its mechanism is not well understood and, in contrast to photosynthesis, the process requires high pressures (from 1 to 100 times atmospheric pressure) and temperatures (100–300 degrees Celsius). More recently, alternative conversion chemistries for the generation of liquid fuels from oxygenated carbon precursors have been reported. Using copper electrocatalysts, CO and CO2 can be converted to multicarbon products. The process proceeds under mild conditions, but how it takes place remains a mystery. Now, Caltech chemistry professor Theo Agapie and his graduate student Joshua Buss have developed a model system to demonstrate what the initial steps of a process for the conversion of CO to hydrocarbons might look like. The findings, published as an advanced online publication for the journal Nature ("Four-electron deoxygenative reductive coupling of carbon monoxide at a single metal site"), provide a foundation for the development of technologies that may one day help neutralize the negative effects of atmospheric accumulation of the greenhouse gas CO2 by converting it back into fuel. Although methods exist to transform CO2 into CO, a crucial next step, the deoxygenation of CO molecules and their coupling to form C–C bonds, is more difficult. 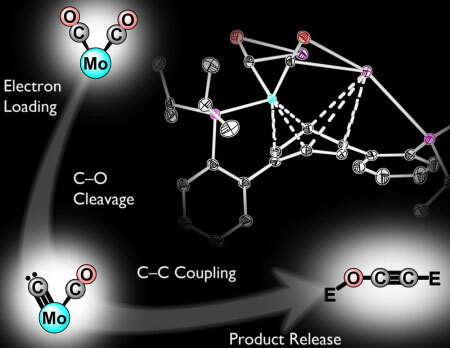 In their study, Agapie and Buss synthesized a new transition metal complex—a metal atom, in this case molybdenum, bound by one or more supporting molecules known as ligands—that can facilitate the activation and cleavage of a CO molecule. Incremental reduction of the molecule leads to substantial weakening of the C–O bonds of CO. Once weakened, the bond is broken entirely by introducing silyl electrophiles, a class of silicon-containing reagents that can be used as surrogates for protons. This cleavage results in the formation of a terminal carbide—a single carbon atom bound to a metal center—that subsequently makes a bond with the second CO molecule coordinated to the metal. Although a carbide is commonly proposed as an intermediate in CO reductive coupling, this is the first direct demonstration of its role in this type of chemistry, the researchers say. Upon C–C bond formation, the metal center releases the C2 product. Overall, this process converts the two CO units to an ethynol derivative and proceeds easily even at temperatures lower than room temperature. "To our knowledge, this is the first example of a well-defined reaction that can take two carbon monoxide molecules and convert them into a metal-free ethynol derivative, a molecule related to ethanol; the fact that we can release the C2 product from the metal is important," Agapie says. While the generated ethynol derivative is not useful as a fuel, it represents a step toward being able to generate synthetic multicarbon fuels from carbon dioxide. The researchers are now applying the knowledge gained in this initial study to improve the process. "Ideally, our insight will facilitate the development of practical catalytic systems," Buss says. The scientists are also working on a way to cleave the C–O bond using protons instead of silyl electrophiles. "Ultimately, we'd like to use protons from water and electron equivalents derived from sunlight," Agapie says. "But protons are very reactive, and right now we can't control that chemistry."